The World Health Organization (WHO) has listed Georgia among the top seven European states, where the measles cases are the most common. The WHO European Regional Bureau data reads that in January-June 2018 more than 41,000 people were infected in Europe with the measles. The list of top seven countries with the measles outbreak looks as follows: Italy, Russia, France, Georgia, Greece, Serbia, and Ukraine. These are the countries where the disease cases have exceeded 1000 in the six months of 2018. The data reads that the largest number of measles cases was reported in Ukraine -23,000. About 32 people died due to the complications. 14 people died in Serbia. In the 2010-2017 period, the measles outbreak was the most intense in 2017- 23.927 cases, the lowest in 2016 – 5.273 cases. According to the latest assessment by the European Regional Verification Commission for Measles and Rubella Elimination (RVC), 43 of the Region’s 53 Member States have interrupted the endemic spread of measles. 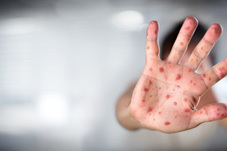 Director of the European Bureau of the World Health Organization Zsuzsanna Jakab says that preventing the spread of measles starts with immunization. "We urge all countries to carry out immunization, to stop the spread of infection. Health begins with immunization. The measles infection has not disappeared,” she added. The campaign for immunization has been underway in Georgia for 1.5 years, but as Paata Imnadze, Deputy Director of the Center for Disease Control (NCDC) of Georgia says, around 10% of people aged 20-40 have not undergone the vaccination. The data of the National Center for Disease Control of Georgia, from 13 January to 20 August 1313 cases of measles were reported, and two people have died due to complications. The measles virus is exceptionally contagious and spreads quickly among susceptible individuals. To prevent outbreaks, at least 95% immunization coverage with two doses of measles-containing vaccine is needed every year in every community, as well as efforts to reach children, adolescents, and adults who missed routine vaccination in the past.